Dirty dishes, I'm done with you. For those of you who may not search for every single tax write-off in America, you may not be aware that gluten-free food is tax-deductible once you’ve got that handy-dandy celiac disease diagnosis. Even if you didn’t realize this, there’s no way you weren’t aware that your bank account started dwindling the second you started adding quinoa flour to your grocery list. My point being, eating gluten-free has other side effects besides that whole, “Hey! I don’t feel like I’m dying anymore!” thing. 1) You’ll be poor, and 2) You’ll be doing dishes all the goddamn time. I, for one, am way over the never-ending pile of dishes in my house. 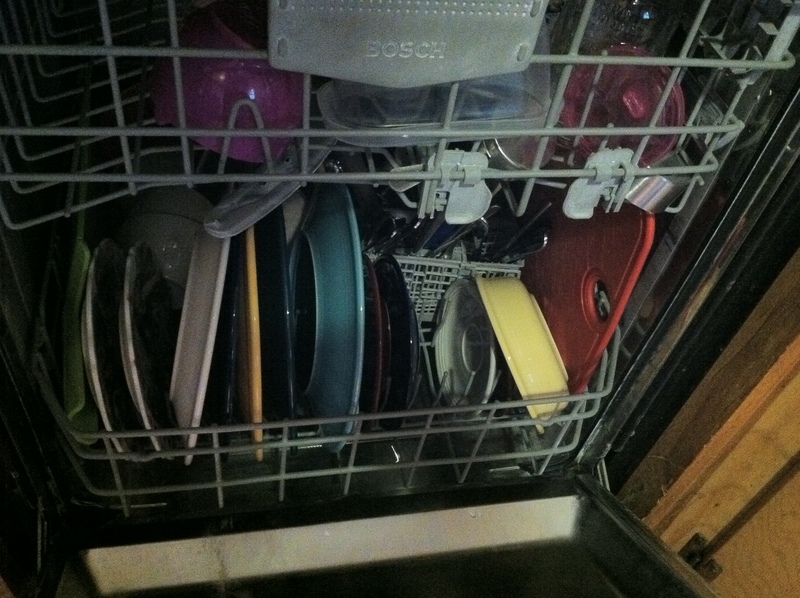 I mean, we used to live in a house with no dishwasher and we never had stacks like this. Also, does anyone else have a dishwasher that runs for three hours? What the hell is that about? This dishwasher is supposedly fancy. What’s so fancy about draining all of the water out of our house for half a day? Dishwasher, you’re a jerk. If you’re reading this blog, you know that I do cook a lot. But if you’re dealing with eating gluten-free, you know that you have to cook a lot or simply drive through In ‘N’ Out and order The Flying Dutchman every night of the week. Don’t think I’m not contemplating that awesome idea. 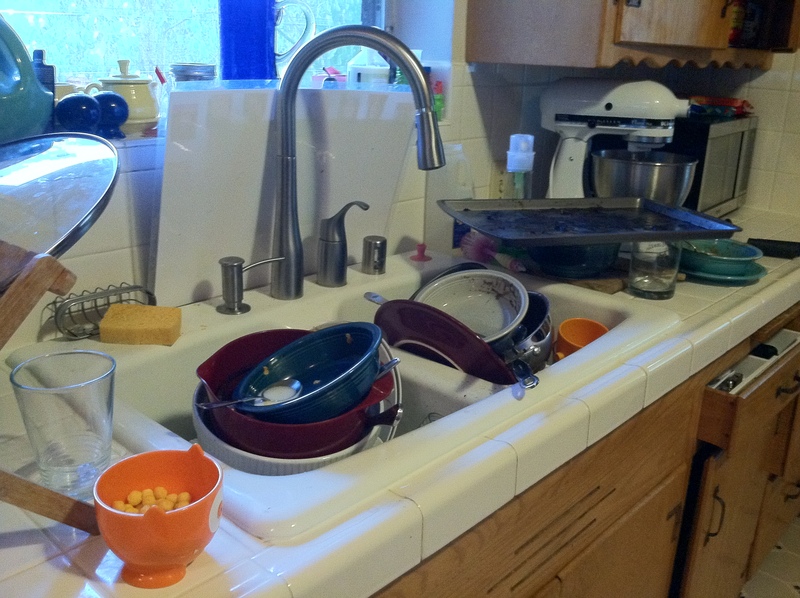 The result is, tons of dishes everywhere I turn. Yes, I’m complaining about doing the dishes. What’s next, my whites aren’t so white? Maybe I shouldn’t be making chocolate pudding in three delicious ways, but if not me, whom? Unlike Martha Stewart, I do not have someone who comes along when I’m finished and cleans up my chocolate pudding powder mess. The dog takes care of whatever has fallen onto the floor, but then who is going to clean up the dog saliva? Clearly, I need to a hire a team of dog and cats to lick the floors, cabinets, and dishes clean. And after that I can hose down the entire place with boiling hot water because ohmygod, animal spit is disgusting. Barring this amazing animal/hot water idea coming to fruition, I’m kind of stuck here in dirty dishes town. Not unlike cleaning out my email inbox, it’s one of those jobs that I would love to outsource. If I could find someone to come in for one hour every day to do dishes and delete all of my daily newsletters, imagine the time I would have! I could make SIX chocolate pudding dishes while finally reading all of my updates from my friends on GoodReads. That would be awesome. Do you have more dishes and less money now that you’re gluten-free? Tags: gluten free cooking, gluten free grocery shopping. Bookmark the permalink. HAHAHA! I run the dishwasher at least twice as often as I did pre-food allergies – so not cool. Right? And I’m so gd cranky about it. I agree. I am over doing the dishes CONSTANTLY. Not to mention in my household there are TWO sets of dishes. One gf set and one with gluten. Good times. I never used to cook or do much in the way of anything back then. I lived a wonderfully oblivious single life with fast food, frozen entrees, and non-food snacks. All with gluten, all bad for me. Very few dishes. Now I actually have to make things and do healthy foods, money has always been an issue, but the cost of anything gluten free is outrageous. There ought to be a law against how high priced things are, especially the gluten free foods that are inedible after purchasing.